Necklaces serve a purely decorative function. And yet the native Indians lavish a good deal of time and materials on them. Why? Well, today these are made mostly for sale to tourists, like the majority of handicrafts featured in this section. Better necklaces command higher prices. Yet these are derived from an ancient tradition which would probably die out without the incentive provided by the tourist market. 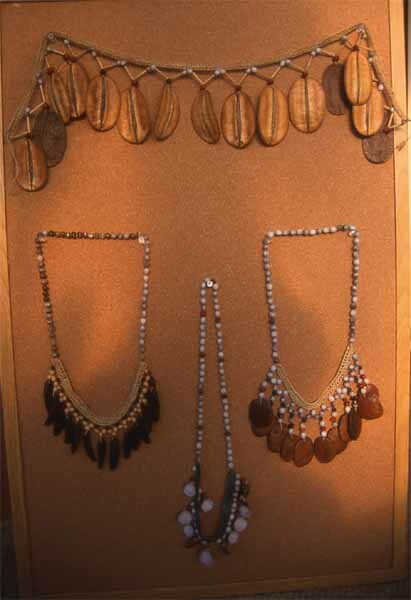 To make the necklaces, a variety of objects are strung on palm fiber string. Among the materials used are seeds, porcupine quills, shells, fishbones, animal teeth and pirarucu scales.